Test programs designed specifically for your equipment. CECO ETS can assist your company in getting a true picture of how differing engine conditions can effect, both positively and negatively, the emissions of your engine. We start by getting a good baseline determination of where the engine is currently operating. Based on that information, emission limits, engine and compressor parameters, and operational realities, CECO's engine experts will design an extensive test program tailored to your specific situation. An example of one possibility would be taking a grid of multiple load conditions versus varying engine speeds. CECO could then provide curves of the pollutants of interest (NOx, CO, etc) graphed relative to torque and rpm from measurements taken at each of the test points. We could also perform timing sweeps or monitor the affect of air manifold pressure by making wastegate adjustments. 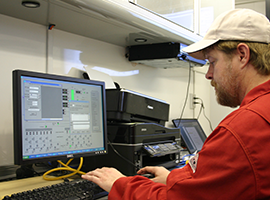 The possibilities are endless, but years of experience in the natural gas industry puts CECO in a unique position to determine what makes the most sense on YOUR equipment and work with your company to develop the best and most economical test program for you.